The Daguerreian Society holds Photography Auctions emphasizing 19th-century photographs and contemporary alternative process images in conjunction with its Annual Conference. 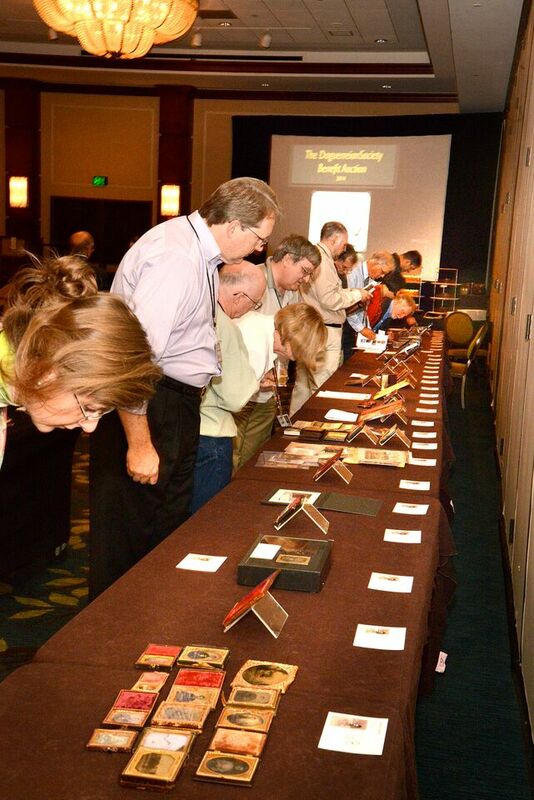 For conference attendees, we host a silent auction before the banquet, which is followed by our premier annual auction This year, our auction will be held the evening of Saturday, October 5th, 2019. The auction catalog is available online. If you are unable to attend in person, you can still take advantage of the offerings by leaving a bid, bidding by phone, or through live Internet bidding. Look for more details on the auction itself under the web site's auction tab about a month prior to the auction. We encourage donations and consignments of photographic-related material in all formats, and from all time periods, particularly items relating to 19th-century photography and its processes, including contemporary art photographs that use antiquarian processes. CONSIGNMENTS. Quality consignments are welcomed. The Daguerreian Society Auction generates strong sales and has set several records for cameras and images in recent years. We especially seek consignments that will realize a hammer price of $2,500 or more. DONATIONS. Donations to the 501(c)3 non-profit Daguerreian Society are tax deductible. All donations are welcome. Donated items with a value of $500 or more will be placed in the live auction. All other donations will be acknowledged and will be placed in the silent auction. TERMS FOR CONSIGNMENTS: We are very selective regarding consignments, to ensure a quality auction and reasonable estimates. Our goals are to raise needed money for the Society and our consigners, and to provide entertainment and quality images for our membership and the collecting community. Please send scans and/or descriptions of proposed consignments to Greg French at gregfren@comcast.net or call 1-617-522-3610. Once approved, consignments can be shipped directly to: Greg French, P.O. Box 302283, Jamaica Plain, MA 02130. Consigners are responsible until items are received, so insurance and/or tracking are strongly recommended. We use the utmost discretion with all of our consignors and commission bidders. Unless specified otherwise, consigners remain anonymous, and all correspondence is confidential. SELLER'S COMMISSION OF 10%. To insure quality offerings, we have maintained an extremely competitive consignment fee of only 10%. BUY-IN FEE OF 5%. To insure reasonable reserves and maintain our extremely high sell through rate, we established a 5% buy-in fee, which only applies to items auctioned with reserves that are applied but not met. For example, if a consignor reserves an item for $3,000 and it is unsold, the buy-in fee would be $150. Consigners are also responsible for return shipping and insurance.